When it comes to hiking in Illinois, it’s hard to beat Starved Rock State Park. However, Starved Rock is not the only game in town. Matthiessen State Park is just a few miles from Starved Rock, and it offers similar views on a smaller scale. It’s typically much less crowded, too, though that wasn’t the case when Mrs. Tires, Trike (our son Jacoby) and I visited on Labor Day in 2016. We departed from Chicago on a beautiful but steamy Monday morning, and after a two hour drive, we pulled in to Utica, ready to hit the trail. The traffic coming off the highway was killer, and it took us a good ten minutes to get from the ramp to the first intersection. After driving past Starved Rock, we approached the entrance to Mattiessan State Park's Dells Trail. This is known as the best trail in the park. Unfortunately, the entrance was blocked off, and a sign informed us that it was over capacity. Surprised but undeterred, we continued on to the entrance to the River Trail. As we pulled in, we were greeted by a packed parking lot. It took us four trips around the lot, but we eventually scored a space. I was quite surprised by the huge crowd, as it flew in the face of the park’s rep. However, a sunny day over a holiday weekend is bound to bring people in, so we shrugged it off. We covered ourselves with sunscreen and bug spray, strapped Trike to my back, and headed out into the forrest. Despite the crowded lot, the grassy straightaway that lead us to the trail was sparsely populated. When we reached the trailhead, we found pretty much everyone else that was visiting that day. They were all hunched over a wooden stand, checking out the trail map before them. When we finally got to the map, we figured out why there were so many confused faces. The map was disorganized and was nearly impossible to decipher. We gave it a glance but gave up on it pretty quickly, deciding just to wander in and see where the trail took us. We were getting a bit skeptical about this place as we trudged in. Fortunately, the dense forest filled with beautifully green trees and brush changed our outlook in a hurry. We were quickly encapsulated by the forest. The trail was rough, a bit muddy, and covered in tree roots, but navigable. 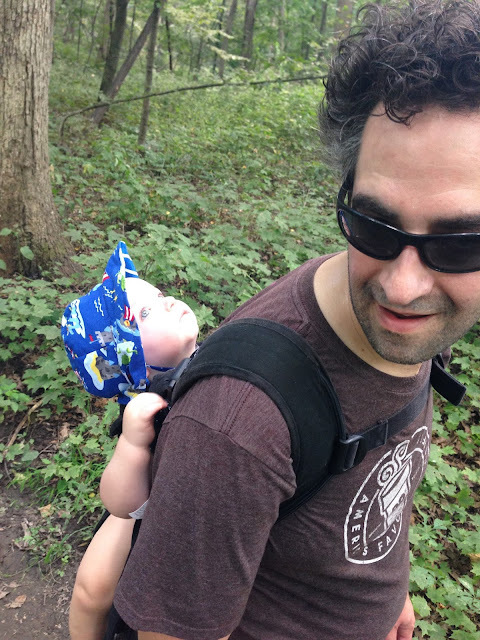 Hiking with a baby on my back was a new experience, and it made me much more aware of each step. Still, the greenery was enchanting, and the light shown through the trees with a heavenly glow. It was a pleasant and gratifying trudge. It wasn’t long before we came to an intersection in the trail, which was quite populated thanks to a different trail map, tattered and worn and even more confusing. We tried to make heads or tails of the map but we were just as confused by the incongruent markings on the map as everyone else was. We conferred with other hikers and decided to turn left. Once we got past the trail map, we were seemingly alone in the forest. There were plenty of other hikers on the trail, but the thick forest made it seem like we were the only ones there. At about that time, Trike became enamored with the view of the tops of the trees. He spent most of the remainder of the hike with his head cocked all the way back, staring straight up at the tree tops and the sky. We could tell he was fascinated by it all. 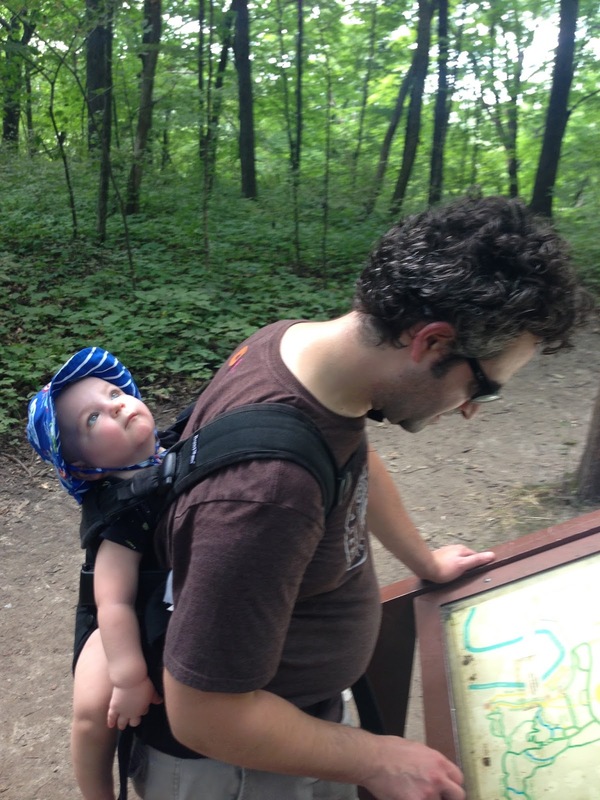 A hiker in the making, no doubt. We didn’t see much wildlife during our hike, other than a small chipmunk at the edge of the trail. However, plenty of birds made these woods their home, as apparent by the frequent chirping and song present whenever we made a conscious effort to listen for it. At one point we heard the unmistakable tap tap tap tap tap tap of a woodpecker, though we couldn’t locate it among the trees. As we kept going, the trail became more hilly, and more muddy. We worked up a good sweat as we proceeded, and we were extra careful at the muddy patches. Trike's presence made us much more cautious in that regard. Fortunately, we successfully navigated the trail without incident, and eventually we arrived at the river’s edge. The river was prominent enough to draw attention, yet shallow enough to cross it if you had a good pair of boots. We were in sneakers, so we kept to the river’s edge. It made for a great place to rest for a while. It may have been the apex of the hike, but because of the shoddy map, we weren’t sure. It ended up being the apex for us anyway. When we turned back, we took a different route. The tail forked, and we went in the direction that brought us uphill. This portion was even less populated, and we were seemingly alone in the forest for the majority of the stretch. It was more muddy than the trails we were on previously, but we avoided the mud well enough and stayed upright. All the while, Trike was cooing and kicking his legs in delight. Our trail selection was a leap of faith, but it paid off, as we ended up back at the second trail map. From there, it was an easy hike back to the trailhead. We were happy about that, as we were sweating like crazy, and Trike’s face was turning red. As we reached the trail entrance, we witnessed an awkward and somewhat humorous scene. One of the children in a family made up of three kids and two adults informed his mother that there was a bug on her. This sent her into uncontrollable hysterics, and she swatted and shook to get the bug off of her. She called to her husband for help, and he came to her rescue, only to recoil when her flailing arms almost caught him in the face. His retreat made her even more upset, as she interpreted his hesitation as abandonment. Finally he got close enough for a good, accurate swipe, and he knocked the presumably poisonous insect to the ground. The kid ran over and inspected the bug. Much to his amusement, it was a caterpillar. Regardless, she launched into a deadly blame game, berating her husband for not rescuing her from the killer butterfly-in-training. We ran into them again when we made it to our car, and she was still laying into her husband for his egregious error. On our way out of town, we drove through the downtown area of Utica, which brought back memories of our previous visit. Eager to relive our past and feeling a bit peckish, we parked the car and strolled down the strip. It was a small but charming downtown area, lined with shops and restaurants. At the end of the street stood Duffy’s Tavern, a bar and restaurant we were quite familiar with. Mrs. Tires and I spent a memorable afternoon there during our previous visit. The place was packed when we walked in, but much to our delight, there was a table in the back with just enough room for a highchair. We instantly remembered the low key atmosphere and the Irish firefighter inspired decor. What’s more, the high chair came with a pack of animal crackers, a nice touch that Trike thoroughly appreciated. We snacked on thick, buttery onion rings and enjoyed some deliciously cold beers, then split a rueben sandwich. All the while, we reminisced, looked back on our hike, and eavesdropped on the loud, jubilant group of bikers on the other end of the room. With our bellies full and our hiking goals fulfilled, we hit the road back to Chicago. On the drive back, we admitted to each other we were slightly disappointed that we didn’t get to go on the Dells trail, but we agreed that was reason to go back. As it was, Mattiessen State Park made for a wonderful one-day excursion, and we were thrilled to have taken Trike on his first hike.